Altitude range. In Ecuador and Peru it grows from sea level to 2,000 m. In Venezuela it grows at elevations up to 1,500 m.
Habitat and Ecology: The species grows in slopes on rocky outcrops, in Atlantic forest and on shallow soil in tropical, seasonally dry forest. It also grows on the borders of humid forests. 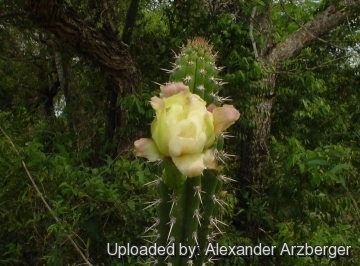 Praecereus euchlorus is widely distributed and locally abundant, occurs in many protected areas, and there are no major threats affecting it. 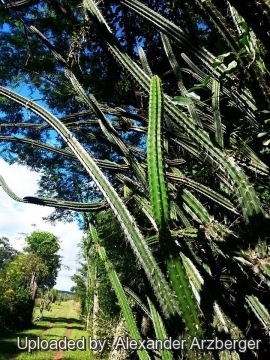 The major threat to this cactus is deforestation for agriculture and cattle ranching. Description: Praecereus euchlorus (Monvillea euchlora) is a shrubby, little branched, thicket-forming or clambering cactus, with rather slender, weakly erect at first, later arching or decumbent, ribbed stems. The flowers are nocturnal, funnel-shaped, white to greenish white up to 8 cm long. The fruit is oblong, fleshy, red; seeds black, obliquely obovate in outline. Praecereus euchlorus is a very variable species. Five subspecies are recognized, the nominate form, subsp. diffusus (Britton & Rose) N.P.Taylor, subsp. jaenensis (Rauh & Backeb.) Ostolaza, subsp. amazonicus (K Schum. ex Vaupel) N.P.Taylor and subsp. smithianus (Britton & Rose) N.P.Taylor. Stems: Slender 4-8 cm in diameter, green. Areoles: c. 2 cm apart, white. Spines: As many as 20, weak, whitish, needle-like, the centrals to 3-4 cm long, black at first, the radials to 10 mm long. Flowers: Not borne terminally, white to greenish white, 6-8 cm long, c. 4 cm across, pericarpels and floral tubes with minute scales but without hairs, bristles, or spines. Inner perianth-segments short, rounded and mucronate, white. the production of male and female reproductive elements at different times by a hermaphroditic organism in order to ensure cross-fertilization. 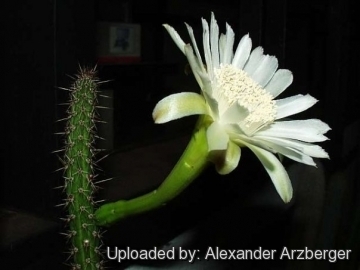 Various attributes observed in the floral biology of Praecereus euchlorus suggest the unusual occurrence of dichogamy in its flowers, that is to say the production of male and female reproductive elements occurs at different times in order to ensure cross-fertilization. Fruits: Ovoid to oblong, 4-5 x 3-4 cm, red, minutely scaly, splitting on one side when mature to reveal white pulp, the withered perianth or at least the style persistent. 2) Machado, M., Taylor, N.P., Braun, P., Oakley, L., Kiesling, R., Pin, A., Loaiza, C. & Ostalaza, C. 2013. 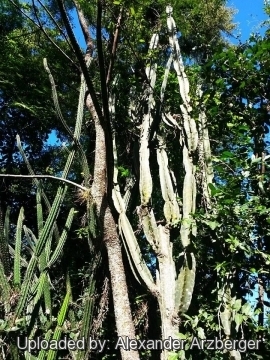 Praecereus euchlorus. The IUCN Red List of Threatened Species 2013: e.T151800A562870. http://dx.doi.org/10.2305/IUCN.UK.2013-1.RLTS.T151800A562870.en. Downloaded on 04 July 2016. 3) Britton & Rose, “The Cactaceae” 2: f. 43, 46, 47 (1920) — as Cephalocereus smithianus. 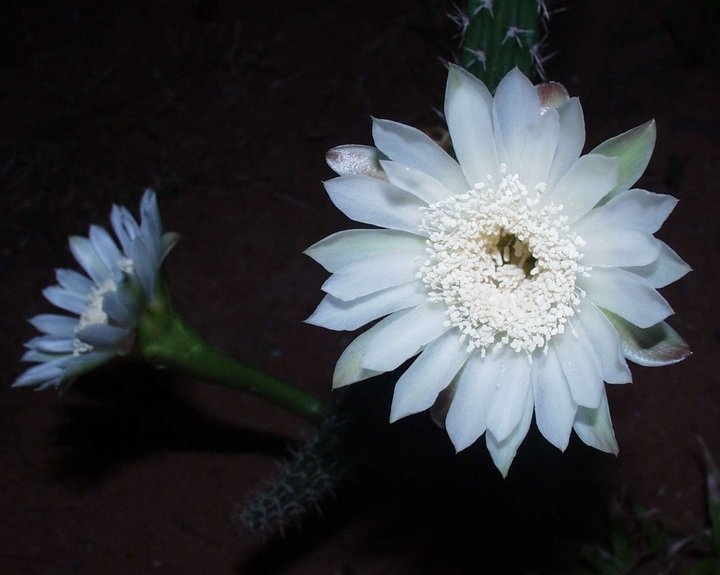 Cultivation and Propagation: Praecereus euchlorus is occasionally grown as an ornamental because of its beautiful nocturnal flowers. It is a fast growing plant that form thickets, the spiny stems often high-clambering or drooping, depending on where they grow. If you can keep it warm over the winter, then Praecereus euchlorus with its lovely flowers appearing during the night, is not as difficult as it is made out to be. It rarely planted outdoors in tropical countries, where climbs trees in a semi-naturalized state. In nature it climbs into trees. Older plants in the greenhouse buds freely. Soil: It needs a compost containing plenty of humus and sufficient moisture in summer (though quite adaptable) it can be also cultivated on split bark like Monstera or in orchid substrate. Fertilization: Too much fertilizer will cause a lot of lush growth at the expense of flowers. Hardiness: Should not be kept under 5º C in winter. Exposition: It perform best if grown in semi–shade but tolerate full sun. Extra light in the early spring will stimulate budding.